Low-cost airline Easyjet has said the disruption caused by August's terror alert cost it about £4m after it was forced to cancel 469 flights. UK airlines had to deal with tougher security measures after police said on 10 August they had uncovered a plot to blow up aeroplanes flying from the UK. That led to delays, extra costs for the airline and compensation claims. Despite the disruption, Easyjet said passenger numbers in August were up 8.4% on the same point last year. Earlier this week, British Airways said that the terror alert cost it £40m after it had to cancel 1,280 flights between 10 and 17 August. The bill included the higher costs of hotels, catering and recovering baggage. Easyjet said it cancelled 469 flights in August. However, the carrier managed to fly 3.1 million people during the month compared with 2.9 million people in August 2005. The company added that 89.2% of its seats were filled during August, compared with 88.4% a year earlier. 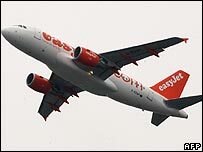 Easyjet, which has carried 32.7 million passengers during the past 12 months, reiterated that pre-tax profits are set to grow by as much as 50% this year.